About 30 miles due north of the beach town of Gulf Shores, Fairhope, Alabama offers small town charm. 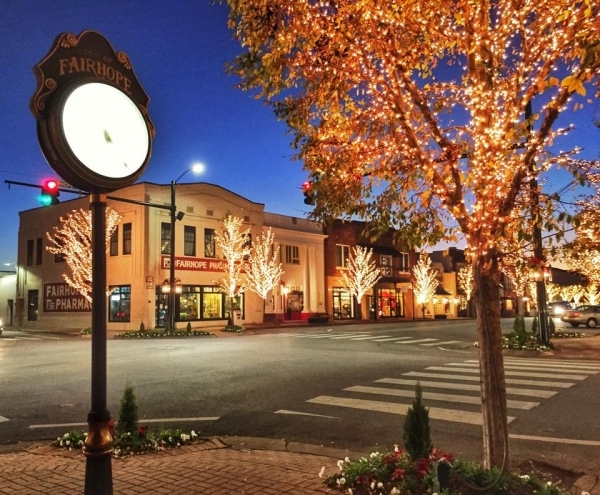 Not only is it known for its lovely parks with moss-draped live oaks, but this quaint township has an array of fine dining restaurants, cozy cafes, stylish dress shops and galleries, many of which line Fairhope Avenue. Just outside of town, Fairhope’s main thoroughfare drops away from the bluffs on which Fairhope sits and winds down to the quarter-mile-long city pier and beachfront park. This is where locals come in the evenings to watch sunsets and gaze across Mobile Bay at the lights of Alabama’s third-largest city, which from their vantage point, must seem light years in the distance. The temperate weather year-round makes Fairhope ideal for most types of outdoor sports - biking, golfing, tennis and fishing. Sailing and other water sports have also been part of Fairhope's tradition from its early days. Whether you’re looking for an opportunity to explore nature, enjoy outdoor sports, sample fresh, local cuisine, experience cultural events, or just laze in the warm, beautiful weather, Fairhope has it all.